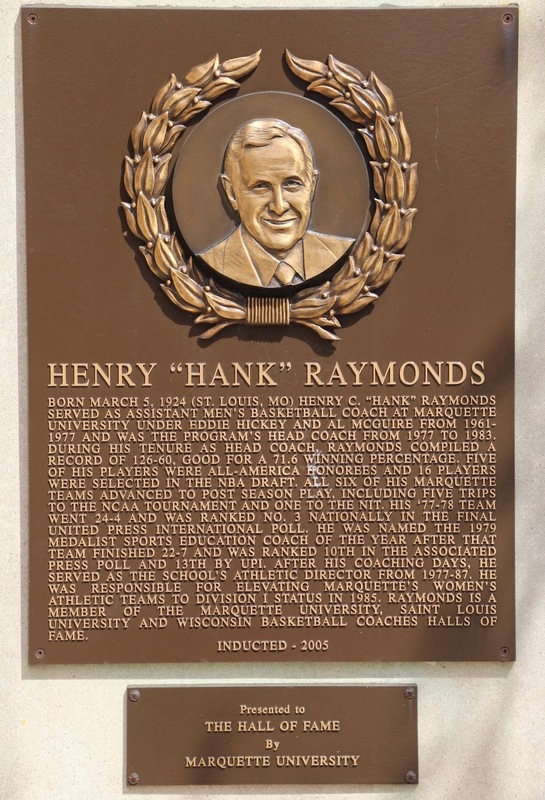 Born March 5, 1924 (St. Louis, MO) [sic] Henry C. "Hank" Raymonds served as assistant men's basketball coach at Marquette University under Eddie Hickey and Al McGuire from 1961-1977 and was the program's head coach from 1977 to 1983. During his tenure as head coach, Raymonds compiled a record of 126-60, good for a 71.6 winning percentage. Five of his players were all-America [sic] honorees and 16 players were selected in the NBA draft. All six of his Marquette teams advanced to post season [sic] play, including five trips to the NCAA tournament and one to the NIT. His '77-'78 team went 24-4 and was ranked No. 3 nationally in the final United Press International poll. He was named the 1979 Medalist Sports Educational Coach of the Year after that team finished 22-7 and was ranked 10th in the Associated Press Poll and 13th by the UPL after his coaching days. He served as the school's athletic director from 1977-87. He was responsible for elevating Marquette's women's athletic teams to Division I status in 1985. Raymonds is a member of the Marquette University, Saint Louis University [sic] and Wisconsin Basketball Coaches Halls of Fame. The marker is located at the Wisconsin Athletic Hall of Fame at the UW-Milwaukee Panther Arena, and is accessible from southbound North 4th Street, between West State Street (to the north) and West Kilbourn Avenue (to the south), at or near 400 West Kilbourn Avenue, Milwaukee, Wisconsin 53203. Inductees honored at this site are members of the Wisconsin Athletic Hall of Fame (established 1951). The Wisconsin Athletic Walk of Fame is a joint property of Wisconsin Sports Development Corporation and Wisconsin Center District. Click here for an Alphabetical List of Inductees to the Wisconsin Athletic Hall of Fame. Use the "Wisconsin Athletic Hall of Fame" label below to view all markers at this location; there are more than 100. The marker is located at the Wisconsin Athletic Hall of Fame. of the UW-Milwaukee Panther Arena in Milwaukee, Wisconsin.